The Associated Equipment Company was best known for it's close association to London Transport, to whom it supplied numerous vehicles. The company more commonly known as AEC dates back to 1906, and was a major supplier of bus and truck chassis until the mid 1980's. The Mammoth Major truck was produced from the early 1930's until the late 1950's. The vehicle was available in 8 or 6 wheel rigid form, and also as a 4 wheel version which was known as a Monarch. The Mammoth and Monarch were bodied with a wide variety of bodywork types, and the Monarch was also used as an articulated tractor unit. The 6 and 8 wheel Mammoth Major trucks formed the bases of of the EFE range at it's launch in 1989. 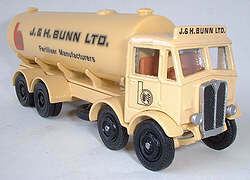 Initially versions were available with four different body types, flatbed, dropside, box van and a circular tanker. An eight wheel tipper truck was added in 1990. while an articulated 4 wheel Monarch tractor unit was added to the range in late 1994, this has so far be coupled to a box van and flatbed trailer, to date the car transporter trailer has not yet been paired with the AEC. 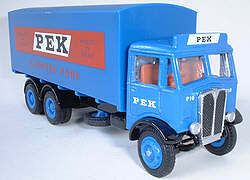 The number of AEC truck models numbers around 80, with most of these appearing between 1989 and 1992. Releases since had been rare and in late 2004 EFE announced a revised version of the Mammoth Major based on the later mark III cab, to produce this version the original mark I tooling was altered thus ending any future production of this version of the model. 10303DL J. D. Lown & Co.